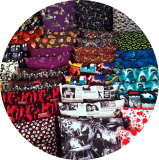 Handmade Pillow Cases and Pot Holders are all made from 100% new materials. Any questions please feel free to email and ask. The front portrays the image. The Walking Dead Zombie Design. Due to the nature of the fabric, the exact placement of the figures/characters may vary from pillow to pillow. The photo above is representative of what you'll receive. If you'd like any specific image more front and center, please email and ask if I can do it, depending on placement on fabric. The front portrays the image. The Walking Dead Hands Design. These Pot Holders actually work, they have a layer of heat reflective material, where the heat is reflected back to the source and away from your hand or counter top. Plus they are in stock now, no waiting for them to be made. The back is quilted black material and edged in black edging. The front portrays the image. Walking Dead Hands Style. Due to the nature of the fabric, the exact placement of the design/characters may vary from pot holder to pot holder. The photo above is representative of what you'll receive. The front portrays the image. The Dead Beat Newspaper. The front portrays the image. Silver and Orange Sugar Skull design on black background. The back is quilted black material and edged in black edging. Plus they are in stock now, no waiting for them to be made. They make great gifts for all your friends and family, help make their kitchen truly unique. The front portrays the image. Star Wars Design. The front portrays the image. Star Trek Design. The front portrays the image. Skulls and Roses on black background. The front portrays the image. Pin-Up Zombies. The front portrays the image. Jaws Teeth Design. The front portrays the image. Jaws Attack Design. The front portrays the image. Jaws Design. The front portrays the image. Jars with colorful creatures and things. The front portrays the image. Haunted Places on Black background. Due to the nature of the fabric, the exact placement of the design/characters may vary from pot holder to pot holder. The photo above is representative of what you'll receive. If you'd like any specific image more front and center, please email and ask if I can do it, depending on placement on fabric. The front portrays the image. Green Bats on Black background. The front portrays the image. Green Bats on Black. The front portrays the image. Colorful Eyeballs on black background. The front portrays the image. Colorful Eyeballs on Black. The front portrays the image. E.T. The Extra Terrestrial Design. The front portrays the image. Dr. Who - Tardis Design. The front portrays the image. Dr. Who - Dalek Design. The front and back have the images of the Cleveland Indians Baseball Logo Design. The back is sewn envelope style to allow for removing the cover to wash or change. The front portrays the image. Classic Monster Design. If you'd like any specific image more front and center, please email and ask if I can do it, depending on placement on fabric. The front portrays the image. Classic Monsters - Frankenstein, The Bride, Wolfman, Dracula, Mummy and the Creature from the Black Lagoon. The back is quilted black fabric and edged in black edging. Plus they are in stock now, no waiting for them to be made. They make great gifts for all your friends and family, help make their kitchen truly unique. The front and back portrays the image. (Glow in the Dark) Cat Eyes on Black. The front portrays the image. Red Blood Splatter on white background. The back is solid red and is sewn envelope style to allow for removing the cover to wash or change. The back is quilted white material and edged in black edging. The front portrays the image. Red Blood Splatter on White. The front portrays the image. Red Blood Splatter on Black. The front portrays the image. 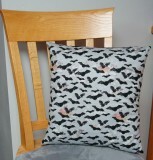 Black Bats on gray background. The front portrays the image. Black bats on Gray.